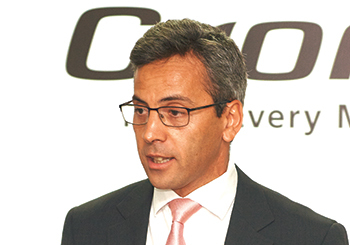 Croner ... launched last year in the Middle East. A total transport solution provider, UD Trucks is a major seller of light-, medium- and heavy-duty trucks as well as special vehicle in the region. Despite challenging conditions in some markets, the company has achieved significant sales growth across the entire region, with particularly strong results in Saudi Arabia and Bahrain. UD Trucks’ expanded line now offers products across a wide range of medium and heavy-duty segments. In 2016 the heavy-duty Quester truck was launched in the region, followed in May last year by the medium-duty Croner truck. The introduction of these robust new products, as well as the addition of the new heavy-duty range for heavy construction Quester 40-tonne /24’ tyres with hub reduction and the 8X4 Rigid, now makes UD Trucks offering complete, said the company. Complementing the new trucks sales, UD Genuine Parts sales have also increased its sales penetration. UD Trucks’ regional offices in Dubai includes a parts distribution centre which delivers over 12,000 different spare parts to the firm’s partners across the region. On its Saudi performance, the truck manufacturer said its sales increased by more than 50 per cent last year compared to 2016, despite the total market decreasing. The biggest downturn in the market was seen in the heavy-duty sector which dropped by more than 30 per cent, however, UD Trucks successfully penetrated the market with the new Quester truck, securing a good market share in the heavy-duty segment. Last year, the company won a considerable portion of a major cleaning project contract from Jeddah Municipality through its business partner, Rolaco Equipement. In Bahrain, the total truck market grew slightly aiding UD Trucks in beginning to reclaim its stronghold in the market with confidence. Last year, sales doubled in the kingdom compared to 2016, thanks in part to the newly-introduced Quester truck. In another positive move for the brand, YK Almoayyed & Sons – UD Trucks’ retail partner in Bahrain – invested $9 million in a 22,000-sq-m state-of-the-art workshop featuring 36 repair bays to service the growing truck population in the country. In 2018, the Japanese brand intends to see a further growth of more than 30 per cent which will see it return as the market leader. Conversely, market conditions in Oman, Qatar and the UAE have been challenging. Oman saw a drop in the total truck market of more than 15 per cent, Qatar fell by more than 30 per cent, and the UAE declined by around seven per cent last year. Despite the tough climate in these markets, UD Trucks sales grew year on year in Oman, and stable sales have been reported in the UAE. The truck manufacturer said Kuwait was also an important market, where its retail partner, Boodai Trading, is heavily investing in new facilities to serve its customers better and keep up with the growing market demand for trucks and for the UD brand. All in all, 2017 was a transition year for UD Trucks in the Middle East and East Africa as it marked the launch of new products, and when the brand has enjoyed a double-digit growth. 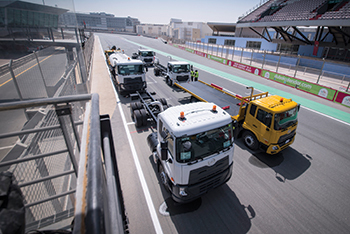 The truck brand enters 2018 with robust optimism, having deals recently concluded with Fewa (Federal Electricity and Water Authority) and Sharjah Police by UD Trucks business partner in Dubai and Northern Emirates, United Diesel (part of Al Rostamani Group).